Oh, my! 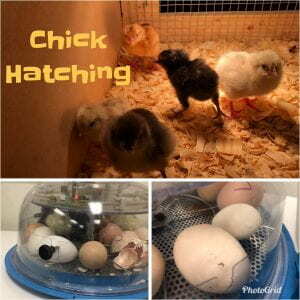 What an exciting hatching week we’ve had in First Grade! Out of 36 chicken eggs, we were fortunate to have 16 baby chicks enter the world in our grade level! Our class welcomed 5 little cuties that were there to welcome us on Monday morning. We’ve been calling them the “Early Birds” since they weren’t scheduled to hatch until Tuesday. I hope you were able to catch a little of the Live Streaming set up by our fabulous IT, Donna Owen. What an amazing week! The chicks are growing so quickly! They usually outgrow the little brooders after a couple of weeks, so we have arranged for someone to take our babies at the end of this week. We will miss our chicks, but are so glad that they will have more space to explore and grow. They will actually be going to my cousin’s farm in Katy, TX so hopefully we can get updates on how they are growing. The students have worked hard preparing for our upcoming Chick Viewing Party (for the school body) and a “Sip and See” for all of you. We will host this event for you on Wednesday, April 24th from 3:00-3:30 in our classroom. You must be in attendance for your child to be able to attend. They will come to you like normal at dismissal. Once the First Grade teachers are finished with Dismissal Duty, we will open the doors for some cute chick viewing and light snacks! Siblings are welcome for this event! FIRST GRADE SHOWCASE: The first grade students and teachers are excited to invite you to come by your child’s classroom on Tuesday morning, May 7, from 7:20 – 7:40 a.m. for our First Grade Showcase. 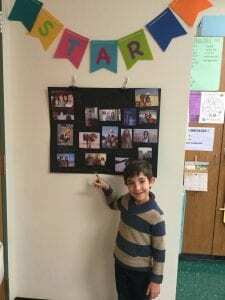 Your favorite first grader will be ready to show you some of the great work that he/she has been doing this year! Then afterwards you are welcome to attend our Volunteer Luncheon Breakfast in the library until 8:00 a.m. to thank you for all the help you’ve given us this year! We look forward to seeing you there! OCEAN DAY: Ocean Day will take place on Friday, May 10th from 1:00-2:50. Our room moms will soon be in contact detailing how you can help with this big event. This will be a memorable day as we celebrate all that we will have learned about the ocean and the animals that live there! Please take a look at the page on our classroom website called “Getting Ready for Second Grade”. It will give you some tips about what you can be working on at home to help make sure your child will be ready for second grade. There is also a page called “Summer Suggestions” that will give you specific ideas of things you can do over the summer to help keep your child interested in learning, as well as prepared for the new school year come August! Read 10-15 minutes every day. Record in the student planner about their story. Our superstar this week is Macy! We are excited to learn more about our special friend. April 24: Sip and See 3:00-3:30 p.m.
May 7: First Grade Showcase 7:20-7:40 a.m.
Volunteer Breakfast in the library 7:15-8:00 a.m.
First Grade Performance 6:30 p.m.
A huge THANK YOU to Alonso’s dad, Mr. Buitrago, Blake’s Mom, Mrs. Ahearn, Shaquille’s Dad, Mr. Hu, Clemente’s mom, Mrs. Cuevas, and Swara’s mom, Mrs. Gaitonde for helping us build our chicken brooder on Friday! It is perfect!! Now that we have a home built, we patiently wait for the arrival of our baby chicks on Tuesday…fingers crossed! 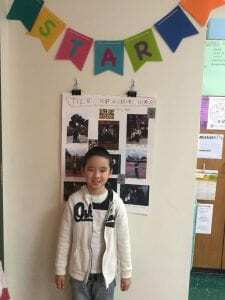 This week Tyler was our Superstar! We loved getting to know him more this week. We will not have a Superstar next week since we will not be in school on Friday. Please take a look at the new page on our classroom website called “Getting Ready for Second Grade”. It will give you some tips about what you can be working on at home to help make sure your child will be ready for second grade. In May, I will add a new page called “Summer Suggestions” that will give you specific ideas of things you can do over the summer to help keep your child interested in learning, as well as prepared for the new school year come August! Stay tuned for information coming from the first graders on a “Sip and See” on Wednesday, April 24th from 3:00-3:30 in our classroom! Parent Input forms for 2nd grade came home recently in the Tuesday folder. They are due back to the office by Monday, April 15th. This helps us prepare staffing for the new school year. Thank you to everyone who has already turned this into me! 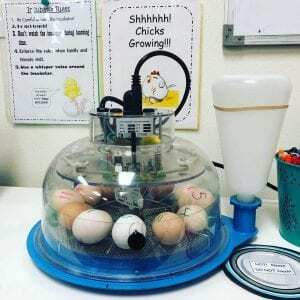 – Continue learning about our changing chicken eggs and hopefully see some hatch! Read 10-15 minutes every day. Record in the student planner about their favorite part of the story. Here’s to an “egg-citing” week! We are getting very egg-cited around 1st grade. We have been tracking what is happening with our eggs and how the chicks are growing and developing. We had a great time on our field trip to Callahan’s General Store on Monday. We learned so much from them and feel confident that we can now take care of these chicks when they finally hatch. Thank you to Molly Sylestine, Ricki Ahearn, Sarah Schneider and Prafulla Nellutla for helping chaperone our field trip! This week we started designing our brooders for them to built on Friday, April 12th. We could still use some volunteers so please let me know if you are available next Friday to help build our brooders. We had 4 groups build a model brooder and then each group presented to the class. 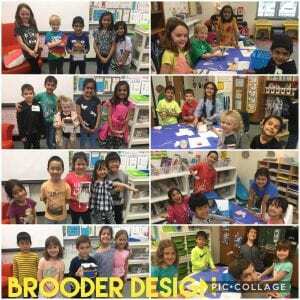 Once the presentations were finished we voted and we are so excited to see the brooder we voted on get built. 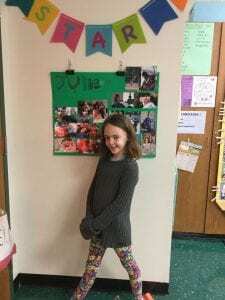 Quinn was our superstar this week and we loved learning more about her! For our upcoming chick unit, we need parent help! 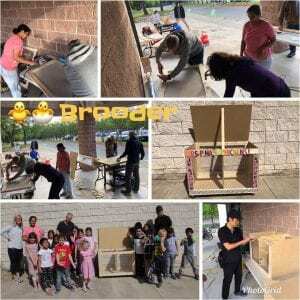 Now that we’ve launched this project, we need a few parents willing to help cut wood and assemble our class brooder. Some of the wood cutting may need to happen before our build day at your house due to heaviness of tools. The building time will take place during school hours (from 8:00- 11:30ish) on Friday, April 12th. Email me if you are available to help out on this date. Thanks so much! Parent Input forms for 2nd grade came home in last week’s Tuesday folder. They are due back to the office by Monday, April 15th. This is the start of our final quarter together in first grade. Spring is in the air and I know lots of students will be involved in many activities. Please remind your first grader that we still have lots of learning to do (as well as fun events planned) and our expectations will be raised as we work on our final preparations for Second Grade. I appreciate your continued support at home with nightly reading homework! Our superstar for this week is Tyler! We are excited to learn more about Tyler and his family! -Prepare invitations and posters for PBL Chick project. 1. Read 10-15 minutes every day. Record in the student planner about their favorite part of the story. 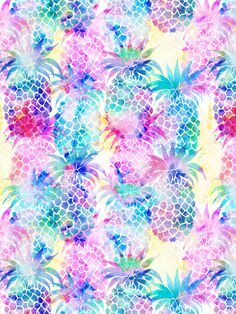 It was a great week back from Spring Break and it sounds like you all had a nice week off with family and friends. I loved hearing all about your fun break! We hit the ground running coming back! We started exploring subtraction a little deeper this week. 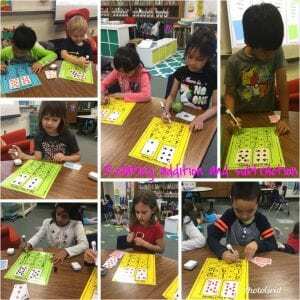 We used our addition skills to help us relate to subtraction. 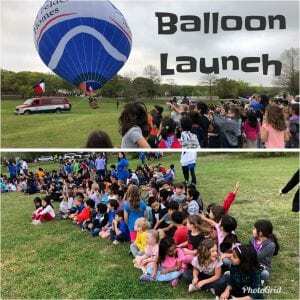 We also got to go and see the 5th grade balloon launch on Friday. The 5th graders make balloons and see how far their designs will float once launched. They also have a hot air balloon as well. 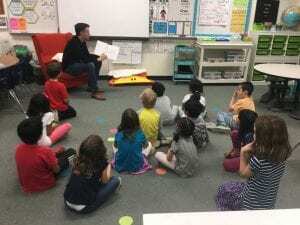 Of course we had a parent reader on Friday. Jade’s mom came and read to us. We love parent reader time! Did you hear the news? We have 12 chicken eggs in our classroom that we are observing! We are very “egg-cited” about those eggs in our incubator! There is a lot to learn about how chicks grow! 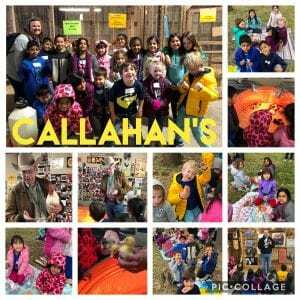 To coincide with our Science learning, as well as our Spring Project Based Learning project, the first graders are heading to Callahan’s General Store on Monday, April 1st! We will learn how to care for our baby chicks once they hatch – everything from providing a living space to meeting their needs. This past week, we brainstormed a list of things that we will need to research. During our field trip, we will gather some very important information! Thank you to everyone for getting the permission slips and money turned into me in a timely manner! We are looking forward to a fun time! 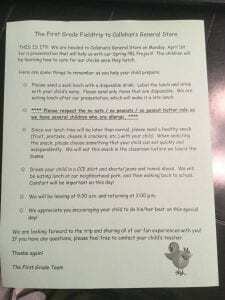 Please remember to read the field trip reminder note that came home on Friday. The directions are a little different than our first field trip. Lunch is much later than normal, so it is important that the children bring a healthy snack to eat in addition to their sack lunches. The snack will be eaten at school before we board the buses. We appreciate your help with this! Below is a picture of the note in case it did not make it home on Friday. Parent Input forms for 2nd grade will be coming home soon. They are due back to the office by Monday, April 15th. Our superstar for this week is Quinn! We are excited to learn more about Quinn and her family! It is hard to believe that next week is already Spring Break! When we return we will only have a little more than nine weeks left in the school year! We had a great week last week and we are ready for a nice break before we come back and finish 1st grade strong! 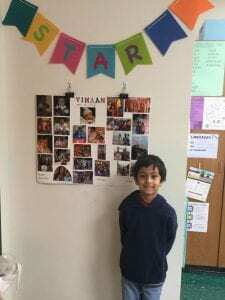 Our superstar this week was Vihaan. It was fun to learn more about him and his family. 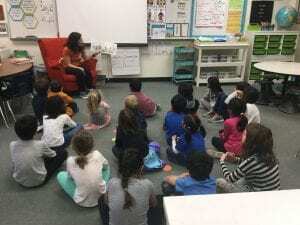 We also had Raiya’s mom come and read to us as our parent reader on Friday! Throughout the year, we work hard to monitor and assess our students to determine areas for continued focus. Three times each year, our Intervention Department administers reading and math screening to help the school staff best target instruction. 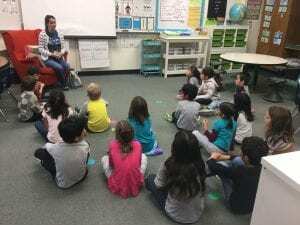 This year, for the middle-of-the-year assessments that the students took in January, the State of Texas mandated that all first graders also take several assessments that will identify children at risk for a reading disability, specifically dyslexia. We received the data late this week that was compiled by our interventionist, and your child’s results are coming home in his/her backpack today. Please do not panic if you see individual areas considered at risk. It is information that we utilize to guide instruction and is only one data point in a collection of data that we use when monitoring students. If there is a history in your family of members having difficulty learning to read (i.e., dyslexia), please let me know. It is something that definitely runs in families and early identification is helpful for accommodating students. For Spring Break, the students do not have a reader’s response sheet to complete. 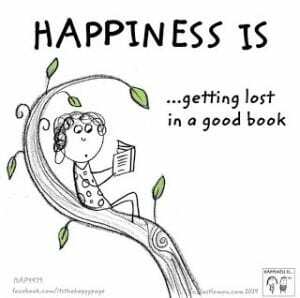 However, please encourage your child to find opportunities to enjoy a good book! We will jump right back in on March 25, so it is vital that they maintain practice. Thanks for your help! On Monday, April 1st, we will visit Callahan’s General Store. This important learning experience will coincide with our Spring Project Based Learning (PBL) assignment. We look forward to introducing the students to an exciting problem after Spring Break which will require their help. If you have not returned your child’s permission slip and/or money, please do so by March 27th. The transportation fee for each child is $6.00. Just as with the first field trip, please send in exact cash or a check made out to CCE. We will be able to accept all the parents who want to volunteer for this field trip as long as you are an approved RRISD volunteer. We ask that you provide your own transportation; carpooling with other first grade parents would be great! Please remember, no siblings are allowed to accompany you. If you would like to volunteer for this field trip, please email me and let me know. For this upcoming PBL assignment, we need parent help. Once we launch the project, we will get more specific details out to you, but we need a few parents willing to help cut wood and assemble a piece of equipment for each class. Some of the wood cutting may need to happen before our build day at your house due to heaviness of tools. The building time will take place during school hours on Friday, April 12th. Email me if you are available to help out on this date. Thanks so much! -Introduce another egg-citing unit in life science! More coming soon! 1. Read 10-15 minutes every day. Record in the student planner about the main idea of the story. This week, we do not have a star of the week scheduled due to our break. We look forward to learning more about our special classmate the first week of April! Wishing you a relaxing and fun-filled Spring Break! Can you believe that this is the last week before Spring Break?! It’s flying by!!!! We have worked very hard this year and after Spring Break we will continue the fun and finish strong! We have some very exciting things coming up in our final semester and we will be looking for volunteers to help us! Thank you to everyone that shared about your culture this week! We loved learning about foods, clothing, etc. from many cultures! We have been really excited for the multi cultural fair this evening! Our super star this past week was Natalie S.! We loved learning about her and her family! As always we love having parent readers on Fridays! Aisha’s dad came and read to us and we really enjoyed our story time! Pay It Forward started March 4 and we need you to help donate to the Rainbow Room Round-Up! The Rainbow Room is a non-profit organization that provides supplies to children in foster care. Girl Scout Troop 2523 is teaming up with the PTA to collect new items like sheets, blankets, toiletries and diapers to pay it Forward to the Rainbow Room and the children in Child Protective Services. Pay It Forward runs until March 15. For this upcoming PBL assignment, we are in need of parent help. Once we launch the project, we will get more specific details out to you, but we need a few parents willing to help cut wood and assemble a piece of equipment for each class. Some of the wood cutting may need to happen before our build day at your house due to heaviness of tools. The building time will take place during school hours on Friday, April 12th. Email me if you are available to help out on this date. Thanks so much! Our students are loving earning money the last few weeks. We continue to defined their roles in the classroom (i.e., listen, complete quality work, help friends, participate, maintain a neat work space, etc.). If they complete their job responsibilities each day, they will receive compensation. In the future, they will have the opportunity to spend their money on a fun classroom experience. The experiences from which they are able to choose will depend on the amount of money they earn during class time. They are highly motivated and our hope is that they will have a better understanding of the choices we all make as consumers. First grade consumers will also have the opportunity to practice saving their money for more “expensive” experiences in the future. It is fun to hear them budget their money! Our super star for this week is Vihaan! We are excited to learn more about our special classmate! Wow…where did February go? It’s hard to believe we are closing in on our third grading period with report cards coming home at the end of the month. We are really stepping up our academic & behavior expectations as “soon to be second graders” and the students are being rewarded for this with pretend money! After a week of earning money, we counted what we earned on Friday and exchanged for nickels and dimes! MONEY SYSTEM: The students continue to earn pretend money for performing their school jobs well. Last week, we defined their roles in the classroom (i.e., listen, complete quality work, help friends, participate, maintain a neat work space, etc.). If they completed their job responsibilities each day, they received compensation. In the future, they will have the opportunity to spend their money on a fun classroom experience. The experiences from which they are able to choose will depend on the amount of money they earn during class time. Every year, the students find this learning experience highly motivating and our hope is that they will have a better understanding of the choices we all make as consumers. First grade consumers will also have the opportunity to practice saving their money for more “expensive” experiences in the future. It is always fun to hear them budget their money! We had some fun visitors in our classroom this week. Mrs. Hougham came for her monthly character counts lesson. This month the word was hardworking! We also had Quinn’s mom come and read to us as our parent reader. We love having visitors in our classroom! On Friday, every student in the school participated in Big Art Day! 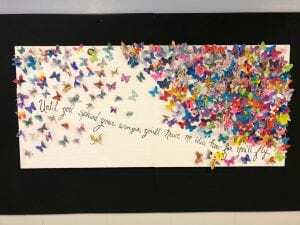 They got to create a butterfly and add it to the school display. It turned out so beautiful! We are so lucky to have such an amazing art, music, and p.e. team at CCE! 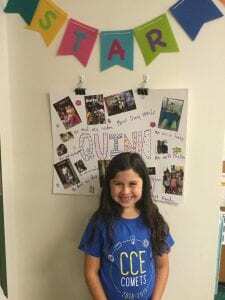 Clemente was our superstar this past week. We enjoyed learning more about our friend! 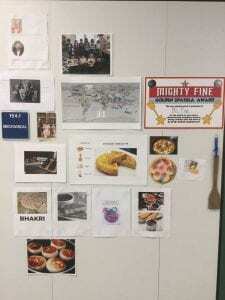 March 4th – Bring a picture of your favorite food from your culture. Tell your class what it is and why you like it! March 5th – Bring a picture of your ancestor. Tell your class where he/she came from, what he/she did, etc.! March 6th – Mark your country of origin on a map in the classroom! 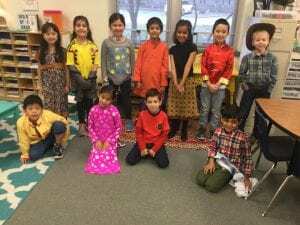 March 7th – Dress in clothes from your culture! March 8th – Bring your family and attend CCE’s Multi-Cultural Fair from 5-8 p.m.! On Monday, April 1st, we will enjoy our second field trip to visit Callahan’s General Store. This important learning experience will coincide with our Spring Project Based Learning (PBL) assignment. We look forward to introducing the students to an “egg-citing” problem after Spring Break that requires their help. The permission slip for this field trip will be sent home on Tuesday, March 5th and is due back no later than Wednesday, March 27th. The transportation fee for each child is $6.00. Just as with the first field trip, please send in exact cash or check made payable to CCE. If you are interested in attending the field trip, please note this on the permission slip. Any parents interested are welcome to join us! 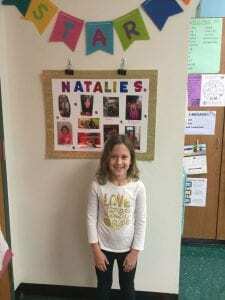 Our SUPERSTAR for this week is Natalie S.! We look forward to learning more about our special classmate! Read 10-15 minutes each day. Record 4 responses for the week. We had a great short week. Thank you for all the sweet notes, flowers, sweets, and gifts for my birthday. I loved getting to celebrate it with all my firsties. 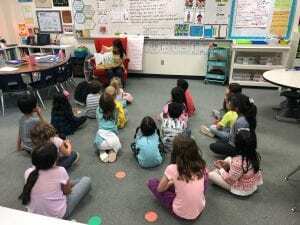 Natalie S.’s mom came to read to us today. Parent reader is always such a treat. The kids really look forward to it all week. 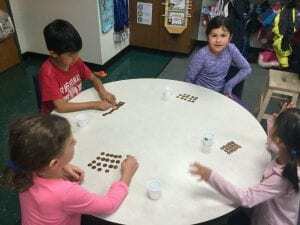 MONEY SYSTEM: As a fun way to help the students understand the basic principles of economics, they will begin earning pretend money this week for performing their school jobs well. 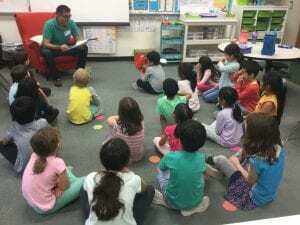 Early in the week, we will define their roles in the classroom (i.e., listen, complete quality work, help friends, participate, maintain a neat work space, etc.). If they complete their job responsibilities each day, they will receive compensation. In the future, they will have the opportunity to spend their money on a fun classroom experience. The experiences from which they are able to choose will depend on the amount of money they earn during class time. Every year, the students find this learning experience highly motivated and our hope is that they will have a better understanding of the choices we all make as consumers. First grade consumers will also have the opportunity to practice saving their money for more “expensive” experiences in the future. It is always fun to hear them budget their money! The library Spring Reading Incentive is in full swing! Packets with reading logs have gone home. All reading logs are due February 28 to receive your free theme park tickets. For Six Flags, read 6 hours. For Schlitterbahn, read 10 hours. The same reading can be used for both, but the but the two reading logs need to be filled out individually. You can get another copy of the form HERE or on the LIBRARY WEBSITE. Did you know that you your student can check their library accounts from home? All you need is their student ID number (without the “s”) CLICK HERE or THIS PAGE on the library website to learn how! Our SPECIAL STAR for this week is Clemente! We look forward to learning more about our special classmate! -Discuss common long i spelling patterns: /i-e/ like dime, /igh/ like flight, and /y/ like fly. We had a fun week last week. We continued our research on either George Washington and Abraham Lincoln and are finishing up our research writing on them. We wrapped up interdependence and started discussing needs and wants. We are continuing our conversations on place value and comparing numbers. Valentine’s Day was a fun treat on Thursday. 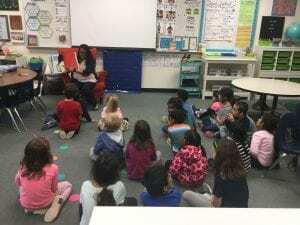 Thank you to all the parents that came to volunteer and of course our amazing room moms, Shweta Arora and Ricki Ahearn, who helped organize the party for the class. I definitely felt the love from all of you. Thank you for your sweet treats, cards, beautiful flowers and lovely gifts! 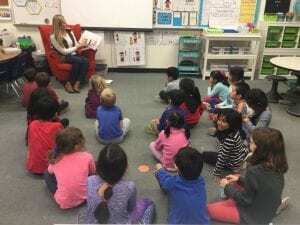 We had our parent reader on Friday afternoon. Juliette’s dad came and read to us. They really enjoyed The Book With No Pictures. I hope you all enjoy your long weekend. Remember that students do not have school on Monday, February 18th or Tuesday, February 19th. We will see everyone back on Wednesday, February 20th! We enjoyed learning more about our friend Juliette this week while she was the superstar. Did you know that you your student can check their library accounts from home? All you need is their student ID number (without the “s”) CLICK HERE or THIS PAGEon the library website to learn how! We will not have a superstar this week since it is a short week of school. We will have our next Superstar the week of February 25th. What fun we’ve had learning about two memorable presidents…George Washington and Abraham Lincoln! 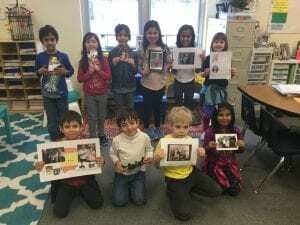 This past week we’ve looked at a number of nonfiction text selections, watched a few videos about their lives and taken notes on facts that we don’t want to forget. Hopefully your child has shared some of his/her learning with you at home! 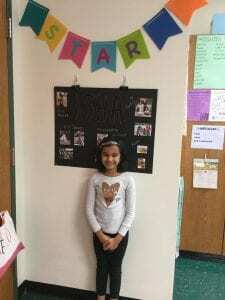 We got to learn more about our friend Isha this week while she is the Superstar. It was fun to learn more about her and her family. In last week’s Tuesday folder your child brought home a class list that he or she could use when addressing valentine cards. We will be making a special valentine bag to hold all of their valentine cards and goodies that their classmates bring! Please feel free to send in your child’s valentines any time this week. I will provide time for your first grader to pass them out before our party on the 14th. Valentines will need to be here no later than Valentine’s Day morning so that we can finish this task before our scheduled party! Many thanks to our wonderful room moms Ricki and Shweta as they are preparing for this fun event! This week our Superstar is Juliette! We are excited to learn more about our special classmate! Stephanie Wear on Tickets Tickets!